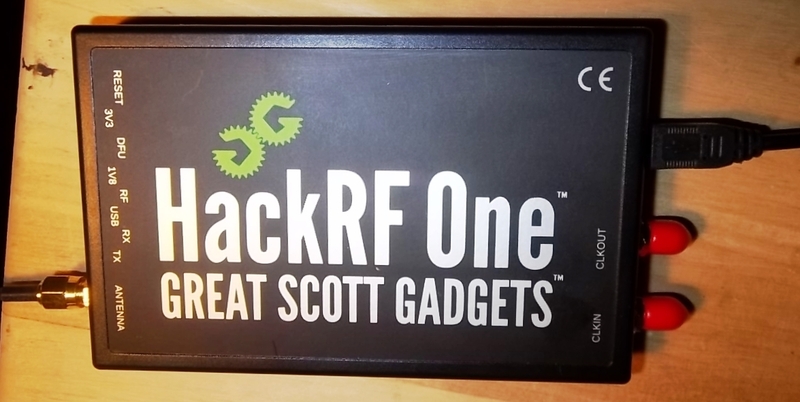 Radio beacons can be found across the RF spectrum from the LF (low frequency) band all the way up to bands inhabited by satellite signals. If you are a ham, shortwave listener or a QRP (low power) buff then a great place to start is on the 10 meter band, which is included on most table-top shortwave radios and even some portables. Beacon signals come and go with band conditions, emanate from different parts of the globe and provide one with listening challenges and hours of fun. So let’s talk about 10m as it’s a good place to start. A good indicator of band conditions on 10m is via the 10m beacon band which ranges from 28.1 to around 28.3 MHz. In general, most stateside beacons are found from 28.2 – 28.3 MHz while DX (ex-US) beacons are heard from 28.1 – 28.2 MHz. However, I’ve heard DX beacons as high up as 28.297 MHz. These stations provide hams and SWLs not only with code practice but with the adventure of hearing low power signals from around the globe. To get acquainted with what is on the air, check out the Ten-Ten International Net website which has one of best lists of beacons, along with a plethora of information on the band itself: http://www.ten-ten.org/index.php/resources/ten-meter-beacons . The Ten-Ten club has been around for many decades and is a good resource of information on 10 meters in general; one can even be issued a unique Ten-Ten ID number upon request. Then, when making 10m contacts you can exchange Ten-Ten numbers with fellow operators. 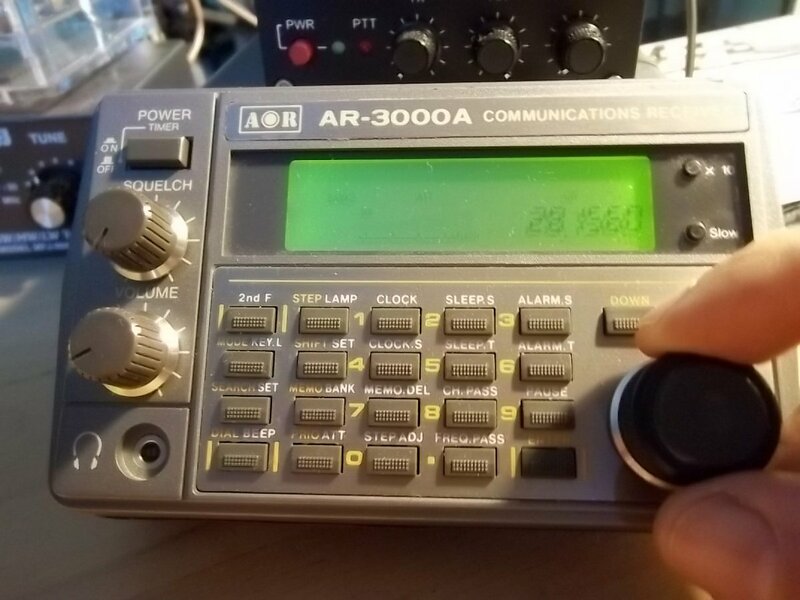 Let your fingers do the spinning of the VFO on 10m. Many of these beacon stations have been logged over the years at this QTH simply because they dot the globe with their low powered one-way signals and are a challenge. Hearing a beacons’ very weak CW signal fading in and out with its’ short message, usually starting with a series of “Vs” followed by the call, then by info such as location, wattage, grid square is a timeless source of pleasure. There are literally hundreds of beacons to hear using your shortwave or ham radio, all coming in at different times of the day from places far and near. And there’s no need to be in the shack; check them out using a portable radio because when band conditions are favorable, you’re bound to hear them. And for those of you with RTL-SDR dongles, these miniscule radios are perfectly capable of receiving beacons and have the added feature of “looking” at that portion of the spectrum both via the 2-MHz wide spectrum display and accompanying waterfall image. 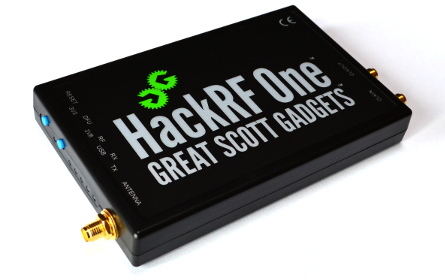 These dongles are an inexpensive entry into HF/VHF/UHF listening and cover all modes. However they are not a plug ‘n play venture, you’ll need a computer, driver program, software to turn the dongle into an operating wideband receiver, patience learning the software, and a good antenna. 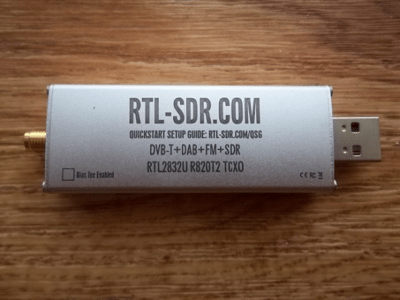 Typical “dongle” Software Defined Radio covering 24 – 1766 MHz. 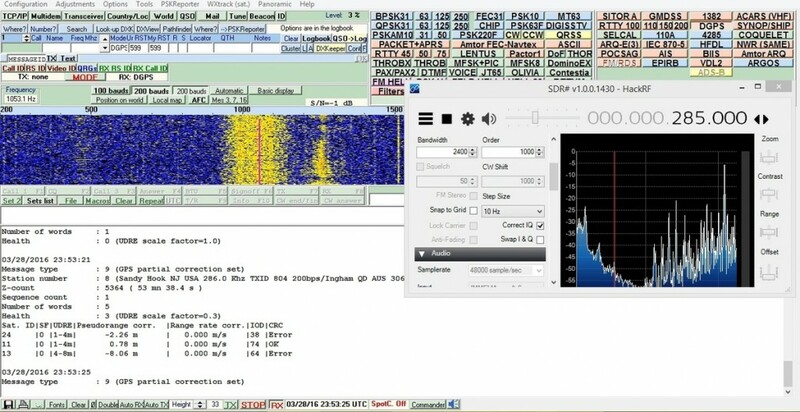 Screenshot of 10m beacon activity in right-half of waterfall on 6/22/15; VA3KAH was heard on 28.168 MHz. Most 10m beacons operate at low power, anywhere from 100mW to as high as 100W but generally operate in the 1 – 5W range using a variety of antennas, the vertical being the most popular. So in essence these beacons are not what you would classify as“big guns” and that’s the beauty of it all. They are an intriguing and challenging quarry to write into your logbook! 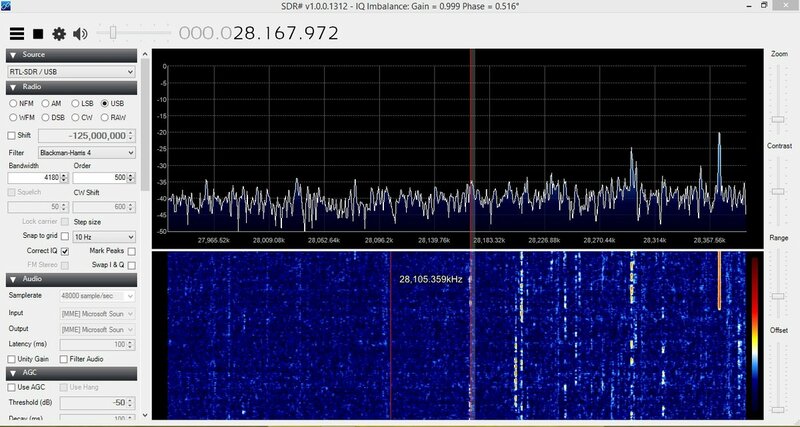 While 10m tends to be more active during daylight hours and when sunspot numbers are good, this doesn’t mean that beacons will not be heard; a quick “sweep” of 21.1 – 28.3 MHz while you are in the shack or outside listening on a portable is always worth a check. Having a good pair of headphones will aid in hearing the weak ones. 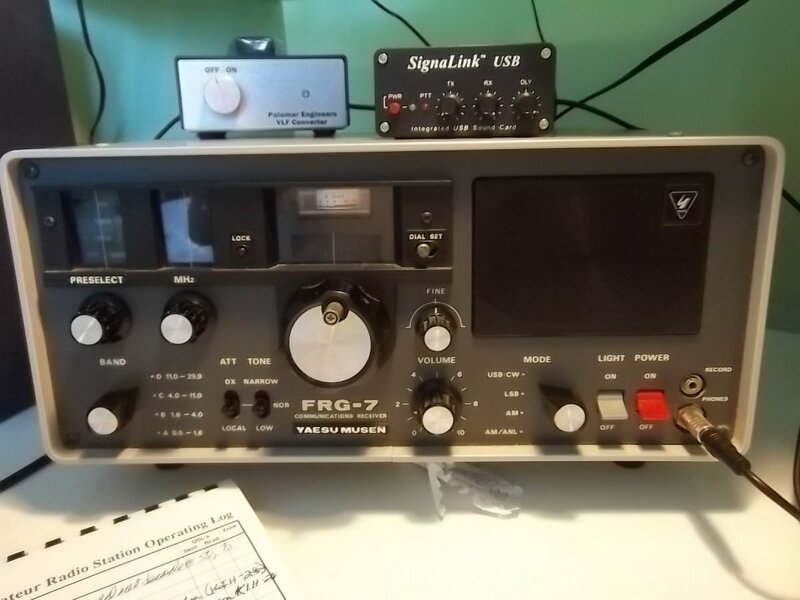 My all-time favorite, the Yaesu “Frog 7” performs well for 10m beacon hunting. To give readers some inspiration, below are some recent morning loggings using an AR-3000A and a 43 foot S9 vertical antenna. Band conditions were not the greatest, with most beacon stations fading in an out and propagation favoring Europe. Using a pair of headphones, logbook and pencil at the ready, it required sitting on some frequencies a few minutes as the beacon of interest faded in an out, until all the information was logged. Most beacons will begin their transmission with a series of “Vs” which helps to identify an active frequency. Some will send a long tone out first, allowing you to fine tune the station, while some start with a series of “dits” to get your attention. As you log these beacons you’ll see that each has its’ own agenda. For example, some only send their call sign. Others will send call sign, grid square, and power. Some even include a website or an address to send QSL information. If your code is rusty, no worries as most beacons send their call at least twice or thrice! My thanks go out to the Ten-Ten International Net (www.ten-ten.org ) for their excellent website covering the 10 meter band and to all those ham operators worldwide who took the time and energy to construct radio beacons for all of us to enjoy. Now, go forth and check out those beacons; don’t assume the band is dead, check out the beacon section of the band which will give you an indication of propagation conditions. Ten meters is very capricious and can open up at any time of the day, even late at night. And don’t forget to QSL the beacon operator! Good luck hunting down beacons and 73’s! Thank you so much for this, Mario! Check out Mario’s other excellent guest posts by clicking here. 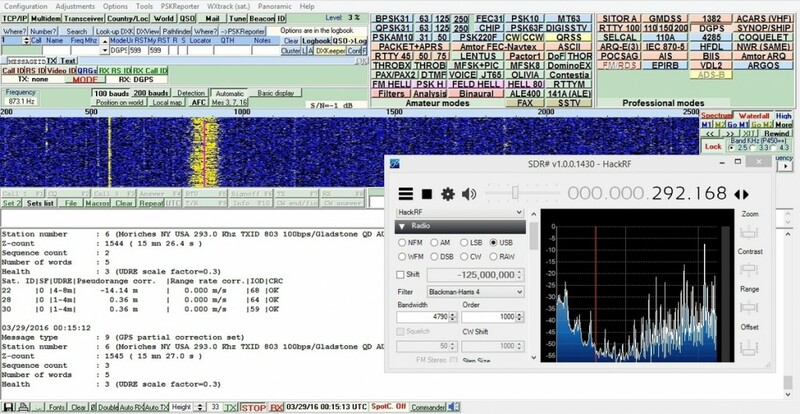 This entry was posted in Articles, Guest Posts, Ham Radio, How To, News, Shortwave Radio and tagged 10 Meter Beacons, Beacons, Mario Filippi (N2HUN) on February 19, 2016 by Thomas.